Our FCSLA Youth Recognition Award goes to 16 year old Luke A. Matulewicz. He lives in Whiting, IN with his parents, Lorie and Al, and one sister, Emily. Luke is a member of S-452. Luke is an active volunteer in his senior branch and also assists the new junior branch. He is especially helpful when the branches are doing a Matching Funds Project. He helps without even being asked. Luke's home parish is Immaculate Conception Slovak Church. As a member of his parish, he was chosen to be the youth representative on the Parish Council and to represent the youth of his parish on the Diocesan Board in Gary. He has attended the Diocese of Gary's Youth Retreat, which is called CYX (Catholic Youth eXperience). He played Pontius Pilot on Good Friday for the Living Stations of the Cross. Luke will be attending NCYC (National Catholic Youth Conference) being held in Indianapolis, Indiana in November. Luke has been involved for three years with the PHYRE (FIRE) Ministry. This ministry is the Youth Group for the Whiting/Roberstale Cluster Parish. PHYRE is an acronym for Peers Helping Youth Reach Enlightment. He is their Technology Manager. PHYRE assists churches, ministries and fellowship groups in learning to present the Gospel and equip willing people to share Christ, anywhere with anyone. At Whiting High School, Luke is part of the National Honor Society, Booster Club, Spanish Club, the A/B Honor Roll and the Science Olympiad team. He mentors elementary students preparing for the Science Olympiad. In June, he was recognized as the Northwest Indiana's Catholic Youth of the Month. 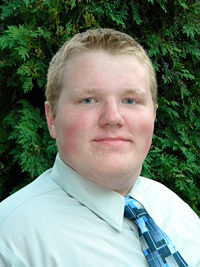 FCSLA congratulates Luke for being chosen as our 2011 Youth Recognition Award winner. We are very proud that he is an active member of our association. FCSLA officers and members wish him a successful future.